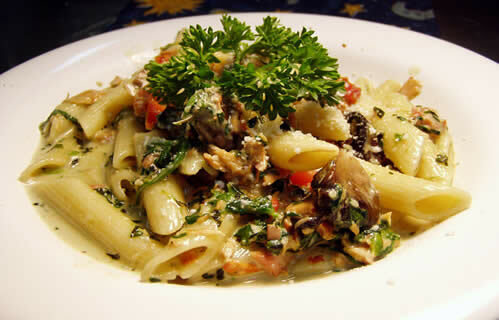 Do you have the knack for cooking especially Italian dishes? If you do then Italian cooking will not be difficult for you. There are many Italian recipes you can try online or check out some Italian cookbooks in the bookstore. There is also a Lydia Italian cooking show in your food network which features original Italian recipes with demos and you will be guided how to choose the right ingredients and techniques of mixing and cooking the Italian way. If you are not satisfied with online learning then there are some Italian cooking schools you can enroll in. Check out Lydia’s website and buy online Lydia’s cookbooks for her recipes. Some books have companion DVD for your cooking lessons at home. Familiarize with the ingredients so you will not get mixed up. Cook your pasta the Italian way. Most pasta recipes will be best if the pasta noodles are al dente or just the right softness, in other words al dente, not mushy. Cooking the Italian dishes uses olive oil and fresh garlic as main ingredients and when sautéing wine is added to enhance the flavor of the dish. Here are some of the ingredients mostly used by Lydia in her recipes so you must have them too, for best results: extra virgin olive oil, canola oil, vinegars (balsamic, red wine, cider and distilled white), and herbs such as dried oregano, dried thyme and fresh basil. Use the ingredients as the recipe requires, for example in Lydia’s Basic Risotto dish the recipe requires Carnaroli rice because it absorbs liquid yet it can maintain a firm texture and also pure flavor so your risotto will not be soggy. Use the right cooking vessels as well as utensils. Among the list of cooking vessels in Lydia’s kitchen are 12- quart stockpot, Dutch oven, 17 x 20 roasting pans, heavy stockpot, and colander in many different sizes, wooden spoons, metal tongs, set of knives and Asian- made spider which is used as a stir- fry tool. Italian cooking is best known for fresh ingredients in their dishes, so it will be good to grow some of your very own vegetables and herbs. Always use the freshest ingredients in your Italian dishes. When cooking your pasta, make sure you follow instructions to ensure that the pasta noodles will have the right softness and will not be overcooked. The thing that makes Italian food taste great is the spices used in the recipe, the fresher the ingredients the better will the taste be. Italian cooking has several courses which start with a soup or pasta, followed by meat with vegetable and then the dessert, preferably a fruit. So when you decide to have an Italian dinner at home serve the dishes the Italian way. To retain the freshness of your vegetables it will be best to store them in a cool and dark place. When you want to cook Italian you must make sure that all ingredients you will need for the recipe you want are available because it will not taste like Italian food if there are missing ingredients or you have changed ingredients. For example, if the recipe calls for olive oil then use olive oil and not your regular oil.